As featured in Inspiration-Letters 17, a biographical account of a journey in search of self; a journey in search of the sunlit path. 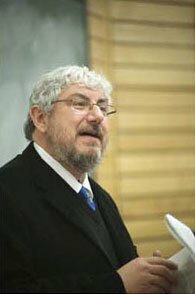 He was a bear of a man, with a bear-like, straggly grey beard, the last vestige and visage of the Rabbinical life-path his Hebrew parents had probably intended, in a preacher-like occupation—Religious Studies professor and faculty head—secular Rabbi to the hundreds of truth-seeking youth who passed through his lecture theatres and tutorial rooms each year. Post lecture, sermon from the mount of Intellectualism, dozens would congregate around him for curriculum advice or, just as likely, words of learned wisdom. For a while, those many years ago while I was under his tutelage, I felt it my mission in life to tread the knowledge-paved road of academia, climb the spiral staircase of learning’s ivory tower, one heaped stack of books at a time. Thus I found myself in his office one afternoon discussing a post-graduate pathway, when a throw-away comment made more of an impression than all the academic advice combined. Like a missing piece of a jigsaw puzzle only I was building, something about this comment fit into place, rang true within the broader tapestry of my life’s finely woven experiences. I was far more interested in this apparently banished, near-forgotten youthful self than the mature one behind the desk before me—the version of my Religious Studies professor that could be ambitious, audacious enough to believe that everything around him, everything he knew might be wrong, than the version convinced that everything he knew was right. You see, I too used to think the world was an illusion, and I too found out that it is real, or at least not to be lightly, easily denied. The Boyds were our neighbours for several years, a family of five in a yellow, L-shaped two story house, just over the neatly trimmed hedge from my Mother and I. Mr and Mrs Boyd, their two cats and three “spirited” boys—spirited to their grandparents maybe, highly mischievous to anyone else with two unclouded, unrelated eyes—soon became friends as well as neighbours, parents spending time and company upon gold velvet lounge suite worth a year’s wages to some, watching living room centre-piece walnut cabinet inlaid television set often conversation-piece as well, while children were banished to invite trouble in myriad ways—starting fires in the backyard to test the efficacy of a toy fire truck; firing stones a hundred metres or more down the cul-de-sac street to mayhem and collateral damage unseen, using slingshots made ingeniously and very dangerously from dressmaking elastic and off-cuts of two by four; exploring a just larger than juvenile body size tunnel whose length was never satisfactorily determined because a working party of concerned parents, not as unaware of our childhood havoc as we might have hoped, permanently filled it in. It was a time when televisions might still be made somewhere other than Japan, and the faux gold lounge suite matching floral pattern wallpaper tracing its way round window and door was fashionable in its own right, rather than in a retro sense, and one suspects, looking back over broader, taller shoulders, that Mrs Boyd, alone all day long in upper middle-class, neatly trimmed and weeded suburbia while Mr Boyd approved mortgages and balanced ledgers in a city bank, might have been quietly going cuckoo, or to use the New Zealand parlance, had a few sheep running loose in the top paddock. Conversations would turn more often to her two cats than matters walking upright and on two legs, and aside from quite magnificently managing the kitchen which produced our Sunday lunches, the rest of her time appeared to be spent assembling kit-set tapestries, cushion covers and floor-mats—all featuring embroidered cats—and reading books more fringe than her hand-crafted rugs. One book in particular stands out in my memory, its cover still visible in mind’s eye where others have faded. Funnily enough I never actually read it—at that stage of my childhood I hadn’t graduated to the adult section of the library, let alone books on fringe science on dusty, taller shelves—but a few comments made by Mrs Boyd as she pressed it upon my Mother lodged in a very curious mind. Microwave ovens were big at the time, and the conversation soon rotated to plastic container cooking techniques. The thought that civilisation could be older than commonly accepted, and, in a broader sense, life be full of hidden mysteries, at an age where—Santa Claus unmasked and tooth fairy banished—life was fast losing its magic, was a powerful fascination to this child—a siren’s call to a shore of promise existing still, just beyond sight. Something felt right in the idea that there was more to life than met a still immature eye, just as it also felt right that “I” had existed longer than my two handfuls of years. Television programs like Arthur C. Clarke’s Mysterious World and Ripley’s Believe It Or Not became weekly tuned to, never missed favourites, watched eagerly for anything to do with lost civilisations, and I spent an entire school holiday mostly indoors, reading every book I could both find and carry home on Atlantis. It was an age and spirit of curiosity, fascination, even seeking, and I could think of nothing more fulfilling than being an archeologist or explorer, crashing through jungles, sifting through mud and sand, searching needle in haystack like just to capture some remaining proof and vestige of glories lost, knowledge drowned. And if it such couldn’t be found, I was desperate to get to heaven, just to finally have the answer to earthly mysteries I assumed none who were living had. Interests come and go in childhood, especially when one has not the means or resources to further them, and after reading every author I could lay my hands upon, and no few crackpots imitating such, Atlantis slowly sank from my mind, replaced by more age-typical concerns like the momentum and trajectory through the air of foot and cricket balls, or how to acquire music when tapes and records cost weeks of pocket money. 1980’s synth-pop and MTV-imagery became my lucre sought for a while. Atlantis rose again in my imagination several years later when, age 15, summer holidays and boredom turned cohorts and captured interest in idle hands, prompted me to visit a new library where a wealth of books on the lost continent could be dredged. Somewhere, amidst tenuous theories based on yet more theories and scratched together half-fragments of evidence, arose something unsought and unexpected: “psychic” evidence. Framed in parenthesis as soon as dreamily uttered, mixing together fact and fantasy as readily as hallucination and dream, psychic evidence is empirically the most tenuous evidence of all, but it wasn’t the veracity or otherwise of anything spoken over a crystal ball that caught my imagination, but rather a single idea first discovered. Atlantis, the well-thumbed, often withdrawn book suggested courtesy of a psychic of unknown repute, was the obverse and reverse to our civilisation of present day, opposite side of coin to our physical, materially-centred culture—a civilisation where that which was inner was light to our outer dark of night. It was heady stuff to my younger self, the idea that everything around one could in a sense be false—that inner landscapes could take precedence, have higher importance than the bricks and mortar of outer surrounds—so heady in fact that I woke one night from fevered, reality shaking dreams, previously stable concepts like ‘here’, ‘now’ and ‘self’ beginning to tremble, the house of my reality starting to subside. It was a two in the morning existential crisis, a wide-awake bad dream, and like self proscribed and administered medicine, I pretty much dropped the ancient civilisation quest there and then. Chopping at the roots of the reality tree is a dangerous occupation when your own reality, barely teenaged, is more a sapling and still growing, and though hugely enamoured of those new found, mind-altering metaphysics, I was still young enough to push to one side something that, neither cricket bat nor football, couldn’t be caught or passed in the right here and now. It would be university before I wrestled with and attempted to wield the axe of knowledge once more. Just inside the entrance to the Religious Studies Department, a Victorian era former suburban home encroached and eventually swallowed by an ever expanding campus, next to the main office where students would queue to ask procedural questions or get copies of lecture notes, was a poster of Swami Vivekananda, pre-eminent disciple of Indian spiritual master Sri Ramakrishna, be-turbaned, arms wrapped powerfully across chest, twinkling eyes piercing infinity and far, far beyond from an original poster for his immortal 1893 Chicago Parliament of World Religions address, where, with the simple opening words “Sisters and brothers of America” he near single handedly introduced and charmed the Western world to the colossal spiritual heritage of his native land. Opposite the Indian spiritual giant and atop descending staircase, as if warning of academic failure and some slippery slope that lay beyond, a poster depicting scenes from the Tibetan Book of the Dead—the seven lower worlds, gleeful fiery demons and the torments of hell. 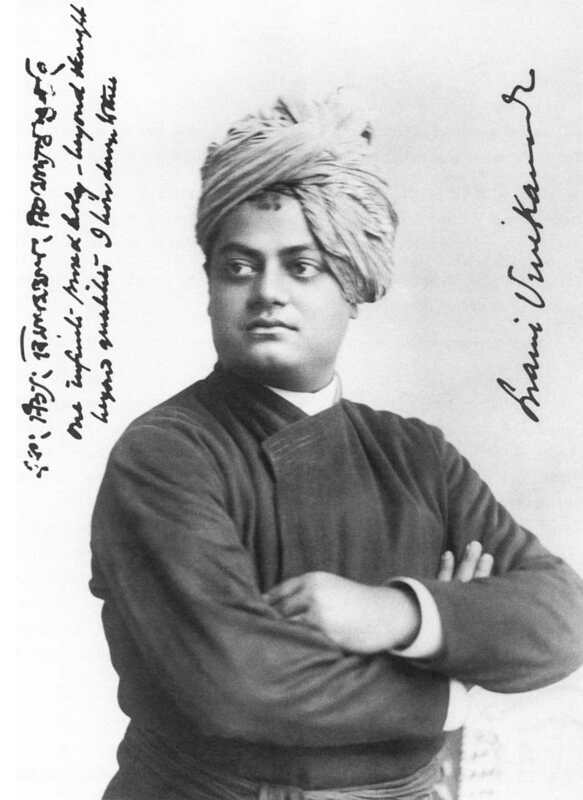 I was on a slippery slope when I entered the Religious Studies Department, and I would wince awkwardly, almost guiltily in front of Vivekananda’s iron, soul-penetrating stare. I had started meditating almost two years before, and after an extended honeymoon period of experiences and near daily unfoldment, was now the living embodiment of the smouldering poster on the opposing wall. Whether tormented for some karmic transgression of a previous lifetime or just the follies of this one, my experiments with self-styled spirituality had lead me down slippery slope to more unhappiness rather than less, confusion multiplied rather than decreased. I had attempted to transcend the here and now, yet was increasingly struggling to live the minute by minute. You wouldn’t have picked my torment outwardly. I cruised through my Eastern Religions paper with ease, answered questions on Hindu deities and Buddhist philosophy almost as easily as if the answers were already written upon the page, but when it came to living, breathing spirituality, to the happiness and joy which even the textbooks will tell you every religion promises as its core, you could say I knew nothing at all. In the quest for self-knowledge I had armfuls of knowledge and nothing more. University wasn’t what I expected it to be. While I had drifted through high school with neither inspiration nor enthusiasm, passing but never applying self to anything studied, university I had hoped, in the vague plan of my life that didn’t really follow any plan, would change all that, finally be the “it”, golden shore and destination that something deep inside said life could be—something to be inspired by, enthusiastic about, seized with both hands rather than dropped or avoided. I didn’t go to university for any conscious reason or aspiration—I had no idea what I wanted to be or do, and had no enthusiasm or feeling of having found what I was looking for in anything offered from the dictionary sized academic prospectus, but I had always assumed I would go, and in the end chose subjects somewhat at random—Philosophy, Psychology and German pencilled into an application form as the lesser of many evils. I ended up failing everything that first semester, in part because none of the subjects, or university itself for that matter appealed, and in part because for the first time in my life not applying myself ended up having a price. But failure did lead me to finally apply myself in an altogether different direction. Unenamoured of anything I studied, almost at my wits end and desperate for anything that might give me meaning and hope, I was quite randomly reminded of my passing interest nay obsession with Atlantis years before, and how there had always been one book in particular, source and reference for many others, that I had never been able to find: Edgar Cayce on Atlantis. Inside the City Library, past the music section where self-conscious, befashioned youth with dyed hair and knee-high black boots flipped through racks of CDs while trying not to catch the eye of other youths dressed just the same, past the book worms who didn’t care for catching eyes beyond those dotted on the page, was the spirituality section, a dusty after thought in the far corner of the second floor where the predominant foot traffic was to the bathroom just beyond. Despite being listed on the Library computer, I didn’t find that particular book amongst those lonely shelves—it had been stolen so many times the exasperated librarians had stopped replacing it—but I did find a biography of Edgar Cayce, and within its pages, quite considerably more. Born to a simple farming family in Kentucky, 1877, Cayce was a photographer, Sunday School teacher and devout Christian now better known as “The Sleeping Prophet” and “Father of the New Age”, who by accident discovered the capacity, from a self-induced trance state, to quite simply explain the miraculous. 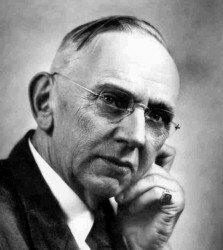 From yet to be invented medical cures to the history and spiritual destiny of mankind, the trance uttered, never charged for words Edgar Cayce were a total revelation, and he and the truths he revealed became a life-transforming figure for me. What was the purpose of life? “To become one with God,” Cayce intoned sagely from a sleep like state. How to do this? “Through meditation, and the example of a spiritual master like the Christ” he asserted, with the same voice that could diagnose disease and prescribe cures from a distance of thousands of miles. That was all I needed to hear, the illumining words I had been pacing aisles and scanning shelves to find my entire life. In the midst of nothing at all—disinterested academic failure and discouraging living squalor—I had found my life-purpose and mission. I started meditating the very same day. In Edgar Cayce and the practise of meditation, I found certainty and surety where previously there had been none, the belief that there was truth in the world and a purpose to life, and that truth, just like knowledge of some lost civilisation, could be found in the here and now. Truth and the ultimate knowledge—self-knowledge—could be found within. Somewhere along the way, countless books and myriad authors read—I travailed the alpha to omega of that library’s spirituality section over the next few months—I gained the impression that the spiritual life is, in practical terms and application, more a mixture of self-discipline, iron will and self-analysis than peace, love and joy. With a ready-mixed, perhaps not fully baked combination of the New Age, Eastern Philosophy and Jungian Psychology, I began, together with daily meditation, a Nietzschean quest to make myself into something more than human. It was like Japanese author Yukio Mishima’s odyssey for perfection of the body, but the subtle body rather than body physical—an attempt to sculpt heart, mind, thought and emotion as though limbs out of shape, transform weakness into strength as though training with weights—through repetition and force of will alone. With its roots in the idea gained all those years ago in a book about Atlantis that the outer world was less real than the world within, I developed my own version of spirituality in which everything in life could be made secondary to will and truth, and began the Herculean task of attempting, a little like the Deconstruction Theory popular in universities at the time, and very much like my world-denying Religious Studies Professor years before, to reduce the people and events around me to something more essential—eagerly sought for, otherworldly phenomena. I had without realising it started down a well-trodden path, the path of Jnana Yoga or “Path of Knowledge”, and a major sub-branch, Advaita Vedanta—the ancient Indian philosophy of Non-Dualism. Founded by the philosopher Shankara in the 9th century, Advaita Vedanta is the belief that the world and all its phenomena are ultimately a “Lila” or play of God, an illusion produced by and inseparable from the workings of the Divine Forces. While not untrue or mistaken in a philosophical sense, denying yourself and the living, loving breathing realities around you is not the ideal starting point for self-knowledge, and if spirituality can be described as a myriad of different routes up a mountain, the path of denial and negation is hardly the sunlit one. In fact, the path I had begun picking my way over was more akin to scaling a cliff-face, if not traversing a giant ravine. Constantly digging, dividing, negating and scouring for a glimmer of truth, some bedrock of reality upon which to stand safe and secure upon, I succeeded in nothing more than making myself more and more helpless and insecure. You can negate your family as arbitrary, this life-time only human relations; relegate friends as people unaware, ignorant of truth; push aside the entire world as materially based and imperfect in every way—and root out every trace of same in yourself—but in trying to shed your humanity like the skin of a snake, just like a snake you are trapped on your belly, crawling only in the mud. The problem with self-analysis is that you tend to miss the wood for the trees, run the risk in turning over rocks of only finding dirt instead of nuggets of gold. Spending your time thinking about your weaknesses and failings is neither affirming nor strengthening, and not at all a basis upon which to build true self-knowledge. Furthermore, in self-analysis you become trapped within the very imperfect, leaky vessel which most needs to be perfected, stuck within the unlit, always tending towards doubt reasoning mind—the limited human mind that is barely capable of seeing or embracing the infinite reality into which we all must grow. The man on the end of the line sounded busy, and despite being the owner of the answerphone’s cheery new age tones and wafting, soothing flute music—encountered on several previously discontinued calls—seemed neither embracing nor interested in conversation. “They start next week, Monday at 7pm…” ‘Was there anything else?’ the unspoken but implied, impatient following line. I persevered. Meditating by myself for two years, at a complete loss with how to deal with the morass of my own making I was stuck within, I was desperate to just talk, swap notes with a fellow practitioner, meet a kindred spirit who might know a little about what I was going through, perhaps be able to offer some guidance or advice on treading the inner road, more muddy trail I was knee deep within. I ended the call none the wiser than before I made it, yet further resigned to the fact that life had, dead ends if not gaping ravines on every side, construed to leave me no course of action but to follow the sunlit path, next Monday evening. Waiting for the first night of the meditation course, I read a book by Sri Chinmoy, and the words of the God-realised master struck a chord, rang an inner bell. Sri Chinmoy’s poetic, deceptively simple writing matched, nodded in agreement with everything I had gleaned so far, but my university over-educated mind was unable to grasp the simplicity therein, was prone, like a lecturer, to talk over the top of the deeper, plain-spoken truths on every page. In the Indian tradition within which Sri Chinmoy has his roots, a single word like “God”, “Truth” or “Love”, said as mantra and repeated countless times, is enough to lead one to enlightenment through realisation of the ultimate truth contained, but if truth was a coin, I was a greedy magpie, too intent on collecting and hoarding than spending or recognising the wealth I already possessed. Love, devotion and surrender are dictionary words we can all know the meaning of, but each can take lifetimes to fully realise. I read of love, the spiritual heart, God and the soul in Sri Chinmoy’s writings, even had my share of fleeting glimpses of all, but was unable to identify or hold on to any because, like drawing water from the ocean with a woefully tiny cup, I was attempting to do so with the reasoning, intellectual mind. This is why Sri Chinmoy advocates meditation in the spiritual heart as the safest, surest way, shortcut and golden path to self-knowledge and God. The heart identifies, expands, embraces and loves—it has the capacity to become the very thing it focuses upon. If meditation in the mind is a treacherous, rocky path, meditation in the spiritual heart is safe and sunlit. I walked around the city block for a second time, heart palpitating, sweat forming, not from exertion but an irrational, sourceless fear. I had arrived early for the central city Sri Chinmoy Centre meditation course, and every ounce of my being was screaming to turn around and go back home, just forget about the classes, do them some other time. Meditating by myself for so long, the whole time spent wanting to find and join others who also meditated, I now for no reason any finger could be placed upon wanted to join only myself, as though, no longer looking for truth under rock or stone, the light of sun was far too intense. In this case, over-practise of mental gymnastics and force of will really did come in use—I simply spoke, yelled over the top of panic and fear, told my mind to shut-up, climbed the stairs to the second story venue as if symbolically reversing down the academic ivory tower. “Is this the meditation course?” I asked a smiling, welcoming lady sitting behind a small classroom style desk. Nice work Jaitra! Very few things on the internet keep me interested for this length. Very inspiring. Hey thanks for reading Pavaka, and for your kind comment! If it doesn’t prove to be at least a little bit inspiring, the time will have come to take away my pen and paper, because isn’t that the whole point in writing? Yours is an interesting journey. It is nice for me to discover the path you have been walking for many years. I think you are a very brave man, and I am delighted with your writing ability. Best wishes, and thank you for sharing, Sharon. Thank you very much Sharon, I’m honoured that you enjoyed the story. .-= Jaitra´s last blog ..Across the Ocean to Swim or Sink =-. “Love, devotion and surrender are dictionary words we can all know the meaning of, but each can take lifetimes to fully realise.” – Love this and it’s so true!!! .-= Brian H. ´s last blog ..Hollywood A-Listers Go Platinum at the 67th Annual Golden Globe Awards =-.